Finishing this book offline was the worst idea I’ve had in a while, haha. So I’m updating here to see if that gives me the final mental boost I need to get over the finish line… also honestly I miss you guys. The other big project I have been mentioning and working on since last year, Electrum, has taken up a lot of my time this year. A lot more than expected, but that’s because I’m an idiot who thought that working on two 300-ish paged books at the same time and doing two Kickstarters by myself, in one year, would be a fun challenge. On the plus side, I’m alive and everything actually seems to be wrapping up okay. This project is a polar opposite project than Mare but very important to me, otherwise I wouldn’t have made time for it. 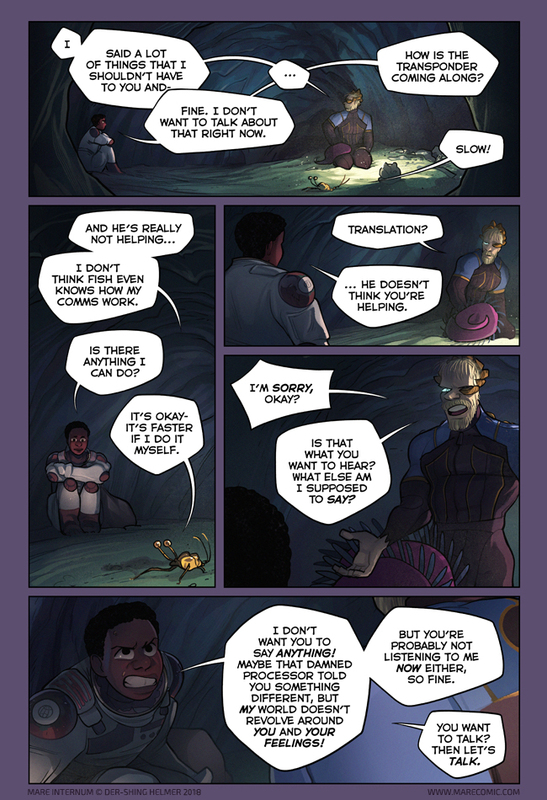 It also represents the work of a team of 30 artists who are not me, which is why I had to make it a priority… and as usual I have a sci-fi comic (time travel this time) in it… anyways, feel free to take a look below if you’re curious to see what we’ve been up to. Please don’t go for any world records on that front, okay? Hahah; glad to hear from ya. First time comment and honestly seeing this has made my whole month better. You are so missed. You’re an inspiration. Glad you’re back! I am a very slow and tired person but thank you I am very, very glad to post again. I also am a very slow and tired person. The fact that you release so much excellent work despite all that is an inspiration to us all. Welcome back, glad you’re alright, looking forward to more Mare!!! Hell YES! So glad you gathered the energy to craft and post a page. Glad you’re back, but take your time :D Be kind to yourself, you deserve it and art takes so much time and energy. As in, you look at them “what was I thinking, this should better be like that” and fixing everything. I mean, there were a lot of stale pages, that you’ve freshen up for the book, right? Somehow today the characters’ relationships don’t seem so hopelessly awry. Or maybe it’s just that I am so glad you’re back . . . So glad this comic is back. I have no idea how many times I checked. Good page! I’m glad to see the resumption of updates. At first I was a tiny bit miffed at Beth for blowing off Mike so brusquely in the first panel. Then I remembered that this would be a really stressful situation, and she quite justifiably would feel that she has more important things to think about. So very pleased to see you again! And again, no apologies needed for the absence – I don’t think any of us can imagine the amount of energy it takes to create the amazing, important and beautiful work you do. Take your time, let yourself focus on what’s important, and trust yourself. We’ll be here. Guys. Guys, c’mon, don’t fight in front of the kid. And Mike was launched off into a fight mode for such a weird reason… It’s not like Bex thinks he’s useless, she just genuinely translated Best Boy’s words. You are a sight for sore eyes/souls. Yay! Welcome back to the updateland! HAHAHAHAHA you timing is beautiful! I didn’t see this yesterday, but 16/10/1995? HAPPY BIRTHDAY ME! I’m please to see that you’re still carrying on with your passion in storytelling, and I plan to stay around to see the end of Mare Internum. Can’t believe it has been 3 years since the first page, and look how far you’ve come. Yay!! It continues! I miss you (and blindsprings) so much! Yaaaay! Welcome back! You can make it! The finish line is right there! Push push push! Heddo! Glad to see this story updating again. Welcome back. I really wanted to buy a digital copy of Electrum, but I don’t have a credit card and Kickstarter does not accept PayPal. It’s a real sin. Don’t worry, I’m here to check each week. If you will announce it, I will be ready to buy it. Yes!! I actually screamed when I saw there was an update! So glad you’re back!! Love the new page – is ThighFriend getting increasingly defensive the more irate Mike gets? And is this a reaction to Mike’s movement or is he maybe responding to adrenaline, etc in Mike’s bloodstream? Either way he a cute, cute critter. on which days do you think you update? i’ve been checking out your work and it seems like it’s mondays or tuesdays, can you confirm? No idea. I’m kind of playing it by ear based on my schedule at the moment but it will be at least once a week for now until I’m done with the other book campaign I’m running. I don’t understand, so the end of the story will only be available in the book? No, the entire thing will go up here, but the PDF will be released to backers well before the entire comic is finished posting. There’s also some additional content in the book and all the edits that will never appear on the site, but the basic story will be the same. I still think both protagonists act weirdly egocentrical, spending more energy fighting emotionally about their relation ( that was not very personal at the beginning, they don’t behave very professional), than dealing with the extraordinary stuation they are in. I would say being in this alien environment, having discovered an extraterrestrial intelligent species, and some kind of organic sentient supercomputer would be more than enough to forget about any petty disagreements. Apparently not. Anyway, I do enjoy your work tremendously, and am happy it started up again. Curious how it is going to play out. Really hoping the end part will shed light on the how and why of all those mysteries you conjured up! Yeah, it is! It’s definitely a people-centric story vs a situation-centric story. It would have been a lot easier I think to just make this a pure adventure comic, but instead it wound up being about people/ crab things/ sharkfriends and feelings, oh boy. I like reading the “there’s a problem ok we fixed the problem” action stories myself but I’m not very interested in writing them. Woo! Welcome back! Time to get down to brass tacks! Oh good, you’re alive. I had grown concerned. I know a lot of artists don’t hit the zenith of their fame until post-mortem, but no need to rush, right?